As well as working towards full restoration, the Trust is committed to the ongoing maintenance of our existing heritage. As a result of the efforts of the Trust many of the original structures have been protected, further losses of cruising waterway have been successfully resisted, notably in Preston, and improvements have been made to the towpath by erecting interpretative panels at various sites along the canal. In addition the Trust has a contract with the Canal & River Trust and English Heritage to maintain, largely with volunteer labour, the Hincaster Horse Path which is a scheduled ancient monument. Since 2012 significant progress has been made on the Trust's First Furlong Project to restore a section of canal between Stainton and Sellet Hall bridges. Using mostly volunteer labour, including several Waterway Recovery Group Canal Camps, the Trust has worked on turning several hundred metres of canal dry bed into a channel holding water. The Trust pursues a participative and collaborative approach, and works in conjunction with various bodies including; local authorities, county councils, British Waterways and representatives from canal users, (many of whom are affiliated to the Trust). The Trust is a registered charity affiliated to the Inland Waterways Association. Funding for our own projects is raised from donations, grants and from our sales stand, which we take to both local and national events. New members are always welcome as help is needed in various ways so that we can achieve the goal of reopening the canal to Kendal. The Lancaster Canal Trust extends a cordial invitation to visitors and local residents alike to come aboard their trip boat "Waterwitch" and enjoy a short cruise along the lovely Northern Reaches of this famous and historic waterway. 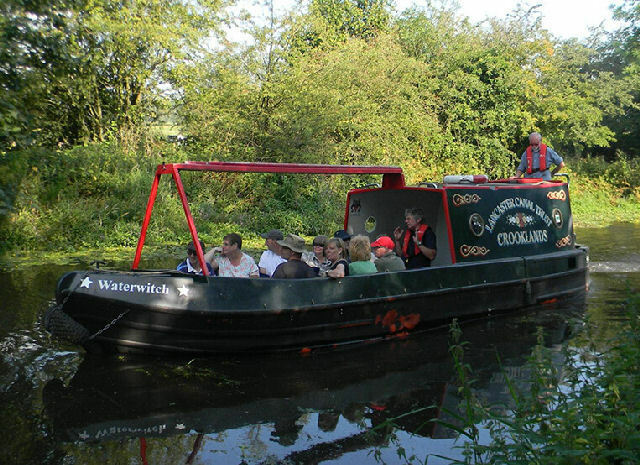 "Waterwitch" is a traditionally designed 28ft narrowboat and can accommodate 12 passengers. She is based at Crooklands bridge 5 miles south of Kendal just off the A65. The boat is crewed by a team of fully trained and certificated volunteers who are all members of the Lancaster Canal Trust.